MailChimp is an email marketing platform for small business and it makes marketing automated. The email list is very important for any person planning to market any product online and MailChimp is awesome in doing the job done by creating the email list and marketing it to the clients. You must have a MailChimp account in order to use the MailChimp plugins for your WordPress. It limits the number of subscribers and emails per month but a quality email list can drag subscribers for you. The better the email list works, the quicker you will get your subscribers. There are many WordPress plugins to add this automated email marketing feature to your WordPress website and it helps to add your website visitors to the email list of MailChimp. So basically it converts your visitors into your customers and helps to add subscribers to your email list. 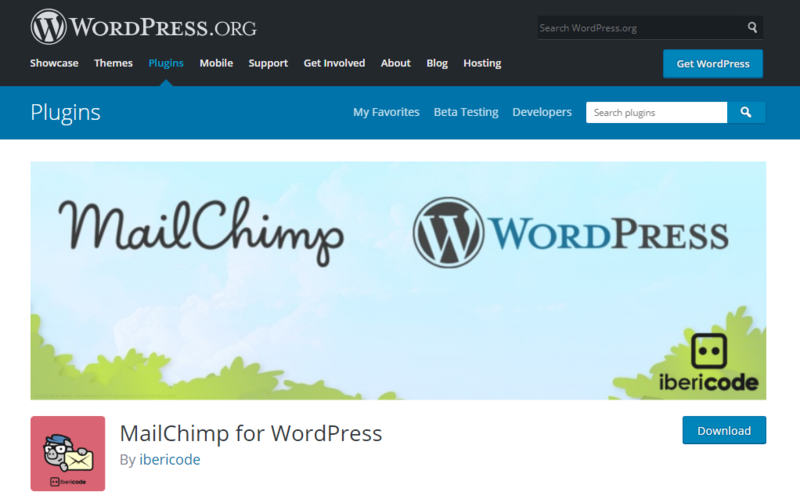 Here is a list of some of the best WordPress MailChimp plugins you can consider for your WordPress website. This is probably the best MailChimp plugin for WordPress and it will make it easy to convert your website visitors to your newsletter subscribers. With this WordPress plugin, you can make your email list and subscribers grow rapidly. 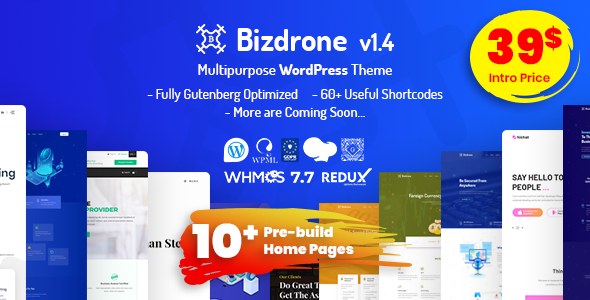 It is one of the most popular MailChimp plugin with over 1 million installations providing you to create attractive newsletters for your visitors or subscribers. Awesome looking opt-in forms can be created with this plugin so you can create your own opt-in forms or if you already have your own contact or checkout forms, it can be easily integrated to your WordPress website. It is possible to connect your MailChimp account with your website by the help of this plugin within seconds. And these forms are very good looking and user friendly which are capable to catch the eye of the site visitors. This plugin will also help you to write newsletters in unique methods. Various comment, contact or checkout forms can be integrated to your forms. So you will have the complete control over the forms. It is well documented and a good collection of add-on plugins are also available including third party plugins. 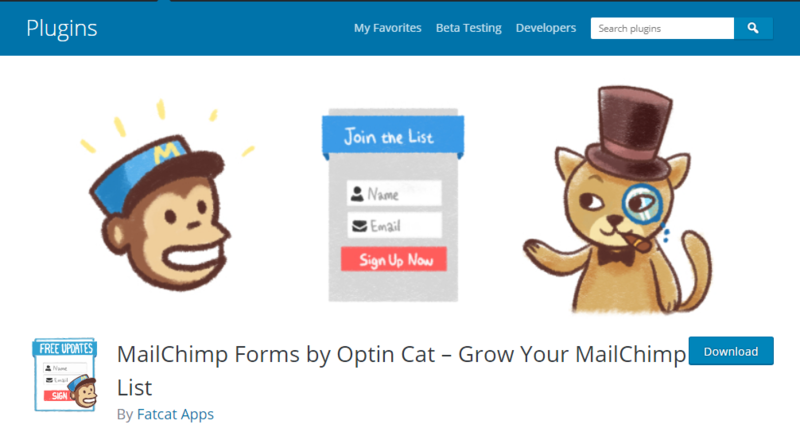 MailChimp Forms by Optin Cat is and advance tool which will provide you beautiful MailChimp forms to maximize your newsletter subscribers and growing a professional email list. You can either build your forms within minutes or can just integrate your pre-built forms very easily. It has the option for you to have MailChimp post boxes, MailChimp sidebar widgets and also MailChimp lightbox pop-ups in the forms. MailChimp post boxes can be addad to your various posts and pages. The MailChimp sidebar widgets will fit in your sidebar and it will make your sidebar rich. And the MailChimp lightbox pop-ups are the pop-up forms that will appear over the top of your content allowing the users to put their details. It features fully responsive design so it will not matter what device you use, you will get the best user experience. Postboxes can be added at the bottom of the pages or posts which can be used to provide any information. It is fully customizable from font sizes to colors and much more. The simple but informative user interface keeps all things at one place right in the palm of your hand. With its beautiful looking and super fast tool, it is possible to create forms in minutes. 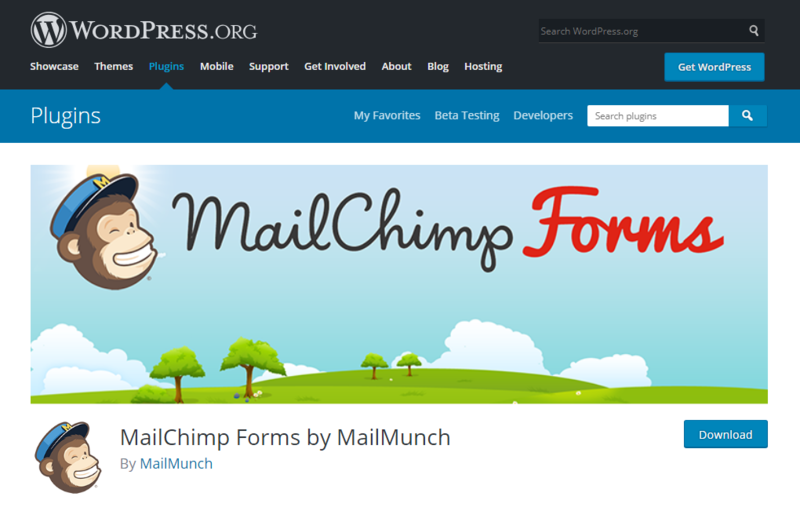 MailChimp Forms by MailMunch will give you the freedom to create unlimited forms for your WordPress site. And in the forms, you can add other sections like the sidebars, widgets and more. It will make you connect with your MailChimp account within minutes and connects all your mailchimp information to your website. This premium tool will allow you to create professional features with your forms like the popup and exit, scroll box, top bar, sidebar widgets and more. 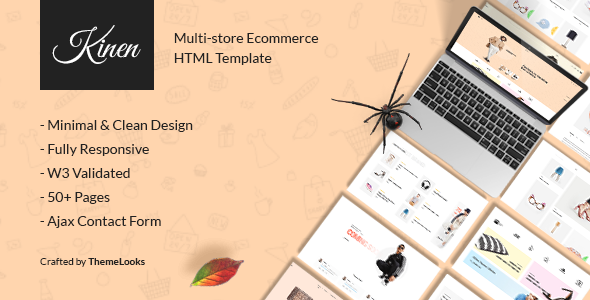 It provides creation of unlimited forms and no API is required to connect with your MailChimp account. You can enable Google reCAPTCHA protection on your forms. After the form submission, users will be redirected to another post or page. After getting registered, existing subscribers will be able to update their profile information. You will also have the power to remove subscribers from your list through your admin interface. The default welcome email can be also disabled or enabled as you wish. Both single and double opt-in is available with it. You will also get your MailChimp analysis and reports. It is also possible to edit your own landing page. If you are looking for a user-friendly, well featured and easy MailChimp integration for WordPress then MailChimp WD is the plugin you are looking for. It will allow you to have the total control over your forms, lists, groups, signup forms and it will help you to grow your subscribers pretty fast. By using MailChimp WD, you can create beautiful forms and email subscription forms and you can also give users the scope to create their custom form fields which makes it great. After completing creation of the forms, you can manage all the forms right from your admin dashboard. The plugin also comes with a variety of useful settings like you can bring up your MailChimp list directly to your website. Also by using your list fields, you can build unlimited subscribe or unsubscribe form. 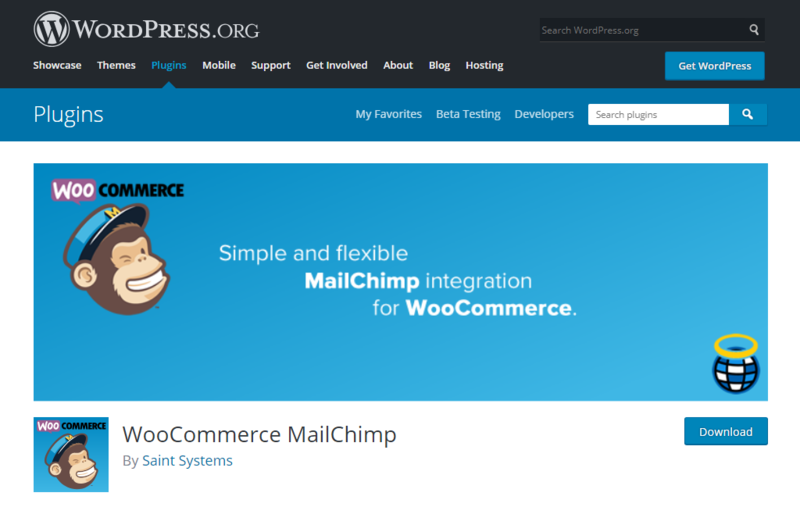 WooCommerce MailChimp is the solution for simple, quick and flexible MailChimp integration with your website. It has the feature of automatically subscribing customers to the desired subscription list. 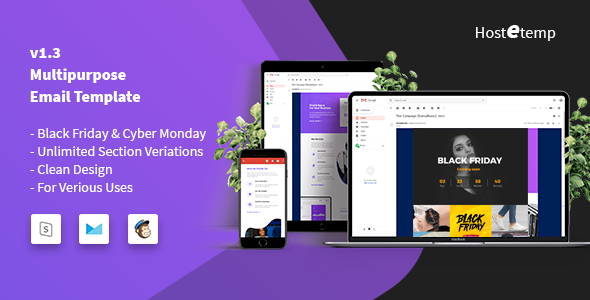 It also has the feature of WooCommerce event selection like subscribing customers to MailChimp after order creation, after order processing and subscribing customers after order completion. It works with MailChimp interest groups and you can add users based on the selected list. It also supports double MailChimp opt-in and it can display opt-in checkbox on the checkout page. Controlling label is available next to the opt-in check box and you can control the check and uncheck of the opt-in checkbox. The placement of the opt-in checkbox can also be controlled from the checkout page.